4657(S): A registry value was modified. 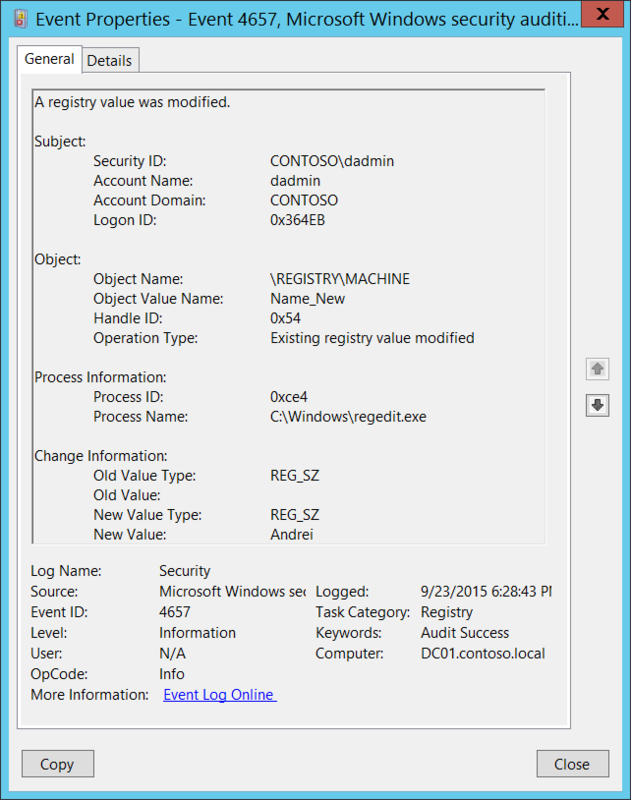 This event generates when a registry key value was modified. It doesn’t generate when a registry key was modified. This event generates only if “Set Value" auditing is set in registry key’s SACL. Security ID [Type = SID]: SID of account that requested the “modify registry value” operation. Event Viewer automatically tries to resolve SIDs and show the account name. If the SID cannot be resolved, you will see the source data in the event. Note A security identifier (SID) is a unique value of variable length used to identify a trustee (security principal). Each account has a unique SID that is issued by an authority, such as an Active Directory domain controller, and stored in a security database. Each time a user logs on, the system retrieves the SID for that user from the database and places it in the access token for that user. The system uses the SID in the access token to identify the user in all subsequent interactions with Windows security. When a SID has been used as the unique identifier for a user or group, it cannot ever be used again to identify another user or group. For more information about SIDs, see Security identifiers. Account Name [Type = UnicodeString]: the name of the account that requested the “modify registry value” operation. HKEY_CURRENT_USER = \REGISTRY\USER\[USER_SID], where [USER_SID] is the SID of current user. PATH – path to the registry key. Object Value Name [Type = UnicodeString]: the name of modified registry key value. Handle ID [Type = Pointer]: hexadecimal value of a handle to Object Name. This field can help you correlate this event with other events that might contain the same Handle ID, for example, “4656: A handle to an object was requested.” This parameter might not be captured in the event, and in that case appears as “0x0”. 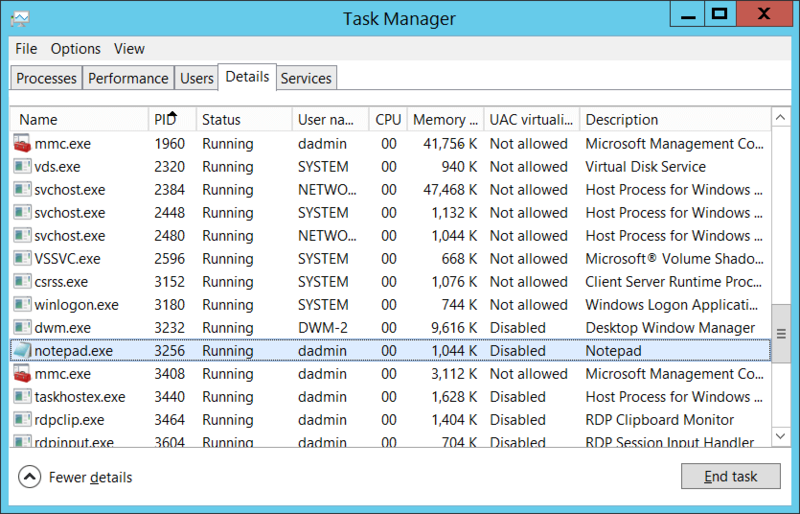 If you convert the hexadecimal value to decimal, you can compare it to the values in Task Manager. You can also correlate this process ID with a process ID in other events, for example, “4688: A new process has been created” Process Information\New Process ID. Process Name [Type = UnicodeString]: full path and the name of the executable for the process. Old Value [Type = UnicodeString]: old value for changed registry key value. New Value Type [Type = UnicodeString]: new type of changed registry key value. See table above for possible values. New Value [Type = UnicodeString]: new value for changed registry key value. For 4657(S): A registry value was modified. Important For this event, also see Appendix A: Security monitoring recommendations for many audit events. If you have a pre-defined “Process Name” for the process reported in this event, monitor all events with “Process Name” not equal to your defined value. You can monitor to see if “Process Name” is not in a standard folder (for example, not in System32 or Program Files) or is in a restricted folder (for example, Temporary Internet Files). If Object Name is a sensitive or critical registry key for which you need to monitor any modification of its values, monitor all 4657 events. If Object Name has specific values (Object Value Name) and you need to monitor modifications of these values, monitor for all 4657 events.